​App page for Resume Designer, an iPad and iPhone app for building a resume (also known as a curriculum vitae). A resume is a key part of your job search. Your resume tells potential employers about your education, experience and work history. A professional looking resume also says a lot about you, so it's important that your resume look great. Smart job hunters have described Resume Designer as "Really easy to use", and "Simple. Effective. Gets the job done!". Rather than having to worry about how to format a resume, Resume Designer takes a simple form-based approach. You enter the information and Resume Designer builds the document for you. 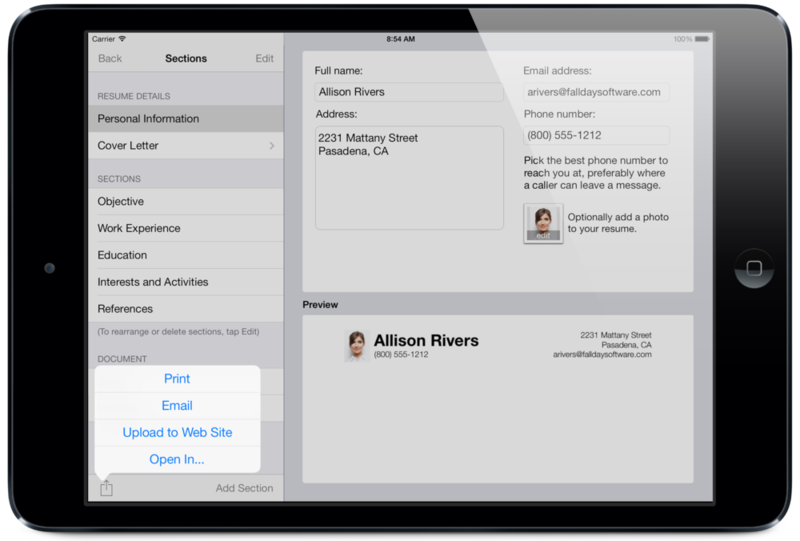 The end result is a PDF document that you can email or print right from within the app. Start with a sample functional or chronological resume, or create your own from scratch. Build up your resume by adding and arranging sections. Customise your resume by choosing header style and fonts. Preview your work at any time. Automatic page breaks so your resume can span more than one page. Print or email your resume as a PDF file (the preferred format for recruiters). Create variations on your resume for different jobs or job types. Automatic sorting of chronological sections like your employment or education history. Sample documents created with Resume Designer: One, Two, Three. Make a good first impression with Resume Designer. Download it now. For information or support, please visit our Questions and Answers page, or contact support@falldaysoftware.com.